The custom, one-of-one Ford Mustang is up for auction with no reserve on Saturday, April 13, 2019 and will likely come with a big price tag as 100 percent of the winning bid will benefit Reach Out Worldwide (ROWW). ROWW was founded by the late actor and car enthusiast Paul Walker in response to the massive earthquake that struck Haiti in 2010. ROWW is composed of first responders and other professionals in the medical and construction-related fields. These volunteers utilize their expertise when natural disasters strike in order to accelerate relief efforts. The car started as a 2010 Ford Mustang GT and was optioned with a glass roof. 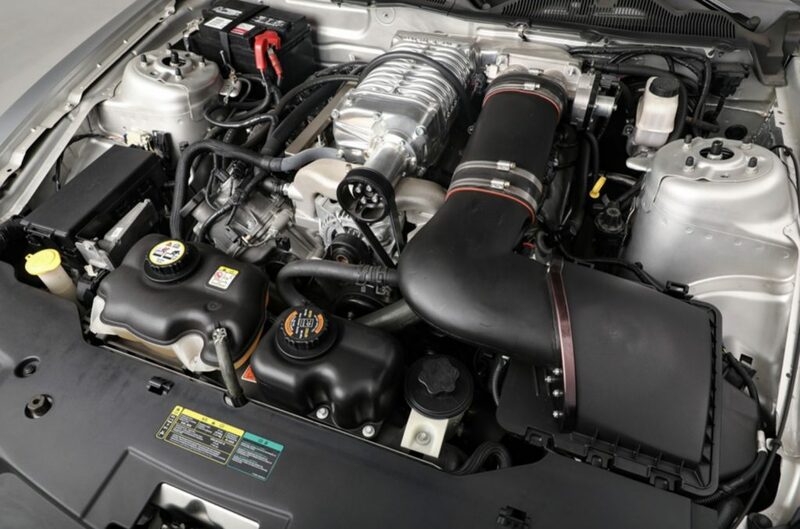 From there it was heavily customized with several Ford Racing performance modifications including a supercharger, handling package, and a high-flow exhaust. The supercharged 4.6-liter aluminum-block V8 generates 550 horsepower and is driven through a 6-speed manual transmission. The handling package lowers ride height by one inch and improves the overall performance feel of this Ford Mustang. As far as the design is concerned, the AV-X10 theme includes an exclusive satin silver exterior paint with a yellow nose cone and matching yellow rear wing. The aviation theme continues with 19-inch Shelby GT500 wheels painted in liquid silver with yellow propeller tips, and white gloss accents. The theme of the car was meant to emphasize the connection with the famous P-51 Mustang aircraft from WWII. The ‘Dearborn Doll’ nickname is displayed on the front quarter-panels along with a pinup girl graphics that once again enhance the authentic connection to World War II-era fighter planes. The optioned glass roof was wrapped with a unique Air Force Star and Bar graphic. Inside, the aviation-inspired theme continues with ‘worn’ leather in a military khaki-shaded color and diamond-tucked door and seat inserts. A Ford Racing pyrometer, boost and fuel Pressure gauges, and unique AV-X10 cluster graphics complete the package. 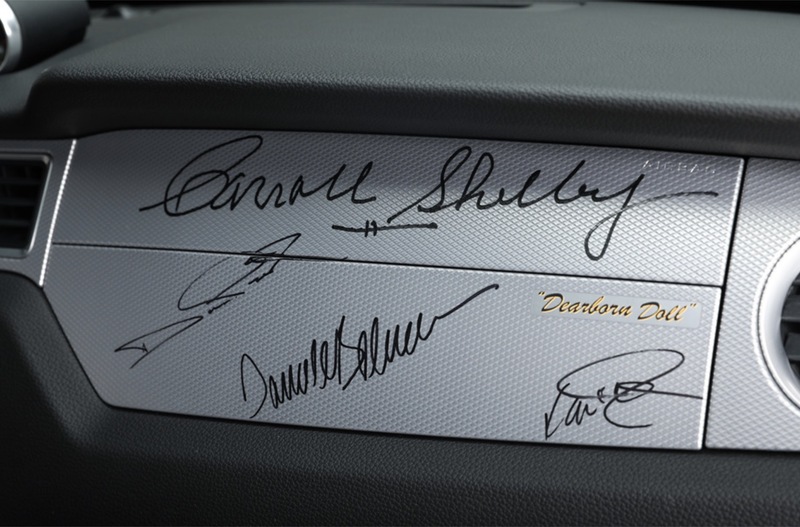 Oh, and some famous guys signed the dash, including the legendary Caroll Shelby. Don’t miss out, this Ford Mustang is going to be auctioned at approximately 2:30 p.m. on Saturday, April 13, 2019.